These Bacon Jalapeno Popper Chicken Roll Ups are flavorful and absolutely delicious! They are stuffed with a creamy bold filling that is pack with heat and cool and provides a satisfying bite each and every time. It is cheesy, creamy and loaded with a fabulous flavor! Chicken recipes are a staple in my home because my whole family can agree that we love chicken. I am constantly looking for ways to jazz and spice up our traditional chicken dishes to provide new flavor into my family’s life. My kids adore cream cheese and cheese so I know if a dish contains these two ingredients its really hard to go wrong. This recipe for Bacon Jalapeño Popper Chicken Roll Ups doesn’t scant on flavor and actually packs a small punch of heat that is quickly cooled down by the creamy coolness of the cream cheese. 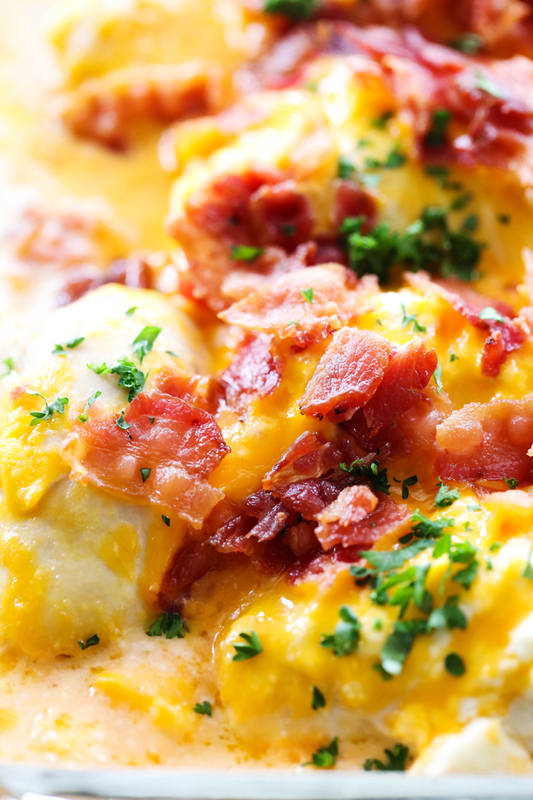 The meal pairs perfectly with bacon and cheddar cheese to really finish off the dish. I used thinly sliced chicken to make thinning it easier for the roll ups. Thick chicken breasts can be pounded out thin but this just eliminated a bit of that pounding. This was adored by my whole family and definitely a recipe I will be revisiting time and time again! 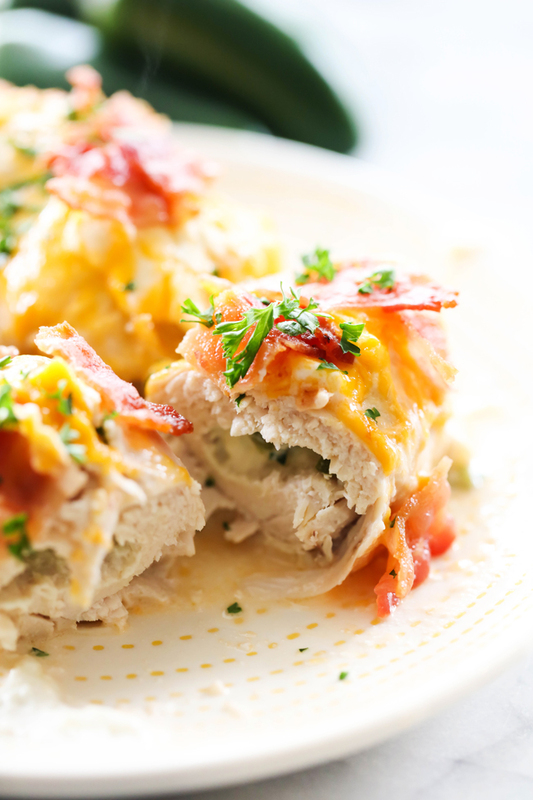 These Bacon Jalapeño Popper Chicken Roll Ups are flavorful and absolutely delicious! They are stuffed with a creamy bold filling that is pack with heat and cool and provides a satisfying bite each and every time. It is cheesy, creamy and loaded with a fabulous flavor! In a small bowl mix 4 ounces cream cheese with the jalapenos. Lay chicken out on a flat working surface. Divide up the jalapeno cream cheese between the chickens and place in the middle of the chicken. Roll up the chicken breasts and place them in the baking dish. With the remaining cream cheese make small pieces and places them over the chicken. Cover chicken with foil and bake for 45 minutes. 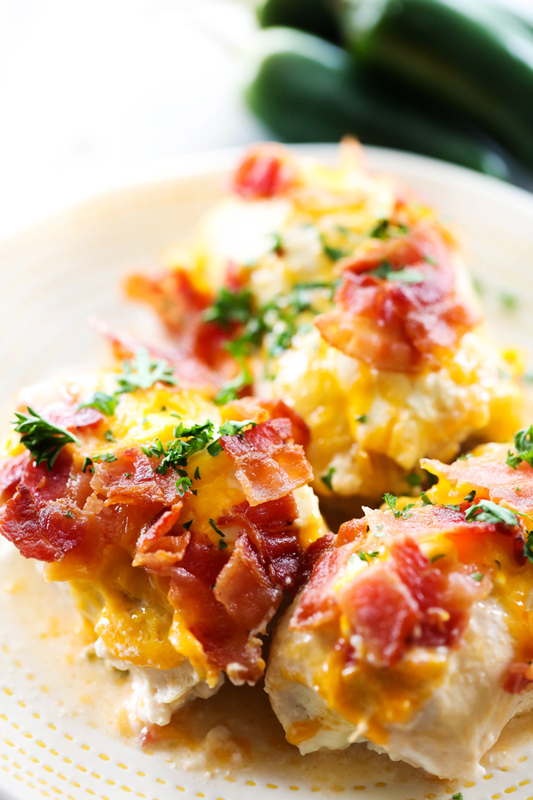 Remove foil and spread the grated cheddar cheese over the chicken and sprinkle the bacon over the cheese. Cook for another 7 minutes or until the chicken is done.